Remember when I used to regularly post recipes on this site? Well it's been a while. Not that I haven't been cooking or baking, I've just been doing a lot of old standards or not photographing. I also like to put original or family recipes, but this one was too good to pass up. 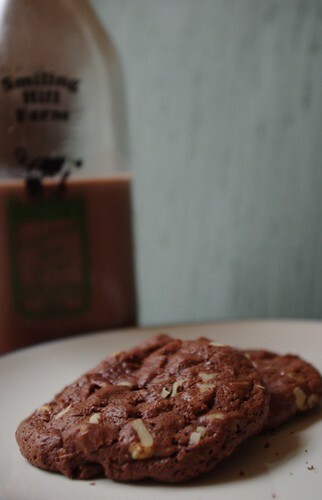 After seeing these cookies on smitten kitchen last week I just had to make them and man are they good - if the pound of chocolate alone doesn't convince you perhaps I can. These are deep and rich and complex - so much so that I, a cookie fiend, can only handle about a cookie and a half at a time. They go brilliantly with a glass of ice cold milk. It is a little hard to find the toffee bars, but it is so worth it. Combine flour, baking powder and salt in small bowl; whisk to blend. Stir chocolate and butter in a metal bowl set over simmering water or doubled-boiler until melted and smooth. Remove from over water. Cool mixture to lukewarm. Beat sugar and eggs in bowl until thick, about 5 minutes. Beat in chocolate mixture and vanilla. Stir in flour mixture, then toffee and nuts. Chill batter until firm, about 45 minutes. Roll the dough into a log 1.5 inches in diameter and chill it. When ready to bake the cookies, cut it into 1/2-inch slices. You can store the dough log in the freezer, wrapped in waxed paper and then two layers of plastic wrap for up to a month, just baking the cookies off as you need. Cookies baked straight from the freezer may need an additional minute or two in the oven, depending on their thickness. Preheat oven to 350°F. Line 2 large baking sheets with parchment or waxed paper. This is a must - otherwise they will stick like crazy!! * I didn't bother with toasting the walnuts or the salt, but it may make the cookies even better, so give it a good if you'd like.